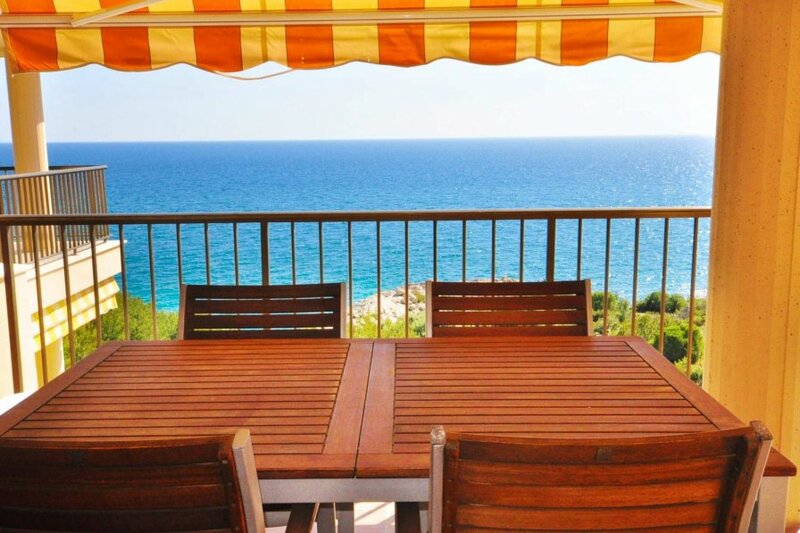 This 2 bedroom apartment with swimming pool is located in Cap de Salou and sleeps 5 people. It has parking nearby. Lovely 2 bedroom apartments in Salou with stuning views over the sea. The apartment its located first line of the sea just 350 mts to the the beach " Cala Crancs". The has a surface of 55 m2 and 15 mts of terrace.The apartment offers has 2 doble bedrooms ( capacity 5 people) , 1 bathroom . The apartment its refurnished and has a lovely terrace with stuning views over the sea.The apartment its located in "Faro de Salou" around 3 km from the centre. This property caters to families with children (all ages) and to singles/couples 30 years of age or older - This property's policy is to refuse certain bookings for the purpose of group events or parties, including pre-wedding stag/bachelor and hen/bachelorette parties. Tourist tax 0.99 € x adult from 17 years, maximum 7 days.